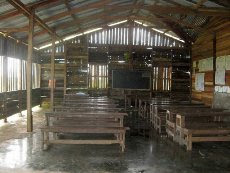 Ka-Ni village orphanage is located near Phyar Pone which was one of the areas affected by the Cyclone Nargis. As it is quite a far reached area, orphanage and village received very limitted donation. Last month, with the help of volunteers, we were able to donate $600 to the orphanage and clothings for children. We want to thank our volunteers, KK team for going out there personally and JL for his inspiration. Below is the report from the field. This trip took more travel time and was more exhausting than the last trip when we found this orphanage while we were going around delta making donations soon after the cyclone hit the region. We could go by car to Phyar Pon last time with short driving time but now to avoid tiredness from lunar surface like road and to bring the donated items, we had to take a ship from Yangon to Phyar Pon. We left Yangon port at 7:00 pm in Saturday evening. The ship cruised all night and docked "Phyar Pon" port at 4:30 am in Sunday morning. We got to have breakfast at 5:00 am in Phyar Pon and boarded a small motorized boat (sampan) at 6:00 am to go to the orphanage. The boat goes out to the sea for about two hours and then turned back into a creek to get to the orphanage. This boat ride going out to the sea was the scariest part for me as I cannot swim. I was sitting stiffed the whole time in the boat wearing a life jacket. It was worst when we were near the sea where the tides were high. On the way there, we saw a boat still ashore on land. The captain of our boat explained the scene of the disaster. He explained to us how their lives had changed overnight and how people, properties and the trees were swept by tidal waves. I came to realize of our Buddha words that things are always changing. The things we always see can disappear in a minute. Nothing is stable. That place was a good example for me. We finally arrived to Ka-Ni village at 8:30 am. We went straight to the monastery to donate money as soon as we arrived at Ka-Ni village. The chairman of the orphanage accepted the money donation. We then donated robes to the monks and the monks asked us to take Sabbath and practice Buddhist Eight Precepts since we arrived there on the day of waxing moon. On Moegyo's behalf, we donated $600 (700,000 kyats for children' general use and 40,000 kyats to add a meat dish for one whole day for the children since they only get to eat beans and vegetables when there's no donor). Total money donated was 12,000,000 kyats for general use and 160,000 kyats for 4 days of adding a meat dish for the children. We were delighted to learn that they will be having meat dish every Sunday for the next 4 weeks. We then went on to see their schools. The orphanage operates primary and secondary schools for the children. All the children in Ka-Ni village go to those schools. After the cyclone, the orphanage began accepting 10th grade students. Those 10th graders walk about an hour through paddy fields to the high school in "Tha Main Htaw" town. During the rainy season, there is no motor way as the roads are too muddy for the small cars to travel and their walking duration extends to 2 hours. Then, they take a bus half way to school that costs 500 kyats. By taking bus half way, round trip to school gets reduced by an hour. They always have to set out to school 90 minutes ahead of the school time. They get back to the orphanage at 1:30 pm since the school finishes at 12:00 pm. The orphanage provides them travel cost and lunch boxes as they can’t have breakfast at the monastery to arrive school in time. Then, we went to the children quarters and distributed 3 big bags of children clothes (including one bag from MHF Thailand), exercise books with lovely cartoon character, pens, pencils, 10th grade text books, snack packs, sweets and jelly. The children were so happy to receive the goods. We then followed the children to their dining room to see them have lunch and took photos. After lunch, we followed the children to their play room. Their play room is one of the child friendly places that "Save the Children" donated. The room contains donated toys, books, comics, and board games. We listened to children reading and participated in their board games. The children sang "Thank You" song to us and we sang other lullabies and nursery rhymes with them. Then, we went around the village to take a look around the damages and repairs. We found that major repairs were not done due to little donations from just a few organizations arrived here as it's quite a far reached area. We also observed that most people in the area are struggling to survive on day to day basic after the cyclone and still can't make extra to donate to the orphanage. That is one of the reasons we came back here to help out this place. Another reason is that we admire the objectives and practices of the orphanage. The orphanage takes in the children and trains them with three aims, to be well-educated, to have good moral skills and to have better living. The orphanage was established on 28th July, 1958 with 59 orphans. It became a registered school on 21st March, 1960. The orphanage only accepted the children of 5-14 yrs old at first. After the cyclone, the house also accepted high school students. There are now 11 high school students. Every Saturday night, the children can watch a movie before bedtime. Now the orphanage plans to hire a study guide for 10th grade students to pass exam with high marks. The orphanage is also considering how they could help them stand on their own feet after they passed their exam. The orphanage promotes and supports the students to acquire good education, have decent career and earn respectable living. We were delighted that part of our donation money could be used for the good purpose for them. We were also glad to see the children happy to receive the goods we donated. We hope to support them more in near future and see them grow up to be good citizens. On the way back from the monastery, I have learnt how life is for the children there and how they have to struggle for survival and advancement in life. As I have never seen such kind of situation, I got shocked when I heard how they survived from the storm. When I heard their stories, my eyes filled with tears and felt sympathy and dismay. It was amazing to see how they had strength to overcome the disaster at their young age. I really admire their courage. At the same time, I thank Moegyo and its donors for sending donation to the orphanage and my friend, JL for giving me an idea to go on such adventurous trip to help the children. Without his idea and sympathetic words for the children, I wouldn’t be on such exhausting and dangerous trip to do this good deed.